Yesterday Bing announced via their blog that webmasters will be getting new Markup Validation Tool inside Bing Webmaster Tools. They say it can be found under the “crawl” tab, I don’t know why did they choose to put it inside crawl tab when this tool is not website bound, in my opinion it belongs somewhere in the root of the Webmaster Tools. 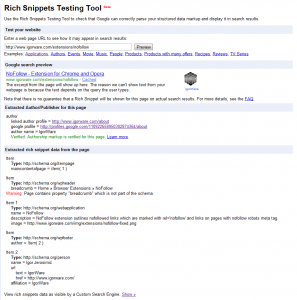 Tool is similar to the Google’s Rich Snippets Testing Tool, but Google does recognize more markup, at least for Schema.org markup that I’ve tested on my website. 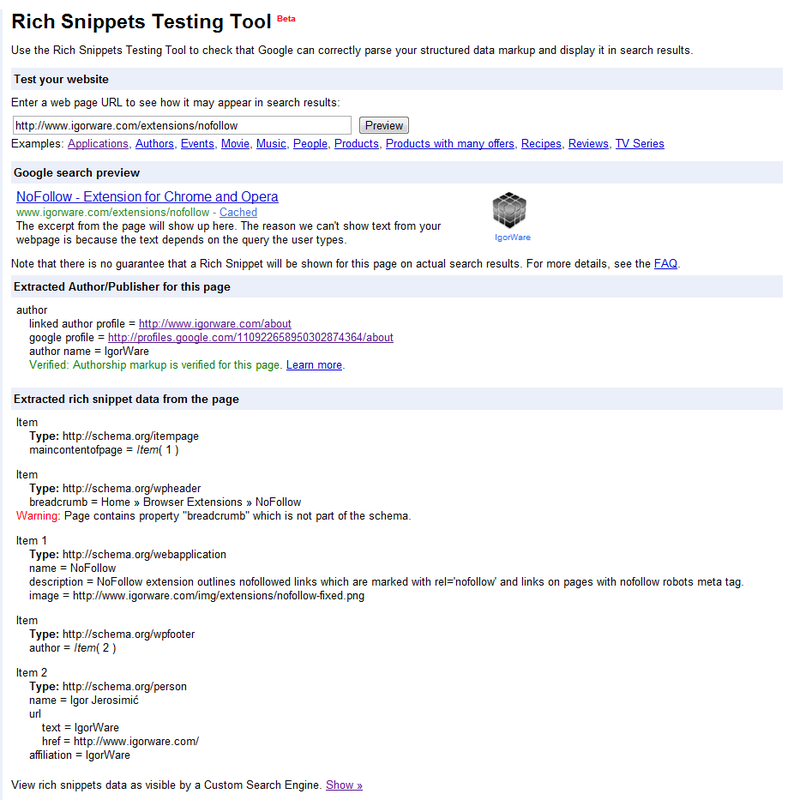 Google also gives us approximate display of snippet the way it will look on their SERP. For some reason Bing decided that they should show new line and carriage return characters (#N and #R in the picture). As far as I know HTML has no use for them so I don’t understand why would they display them on their validation tool. I used my NoFollow extension page on both markup validation tools, as you can see Google recognizes far more markup data than Bing on the same webpage. But this is just the first public release of Bing’s tool so I guess they will probably work on it some more… Or maybe they decided to only show markup data that they actually can use for crawling and not confuse webmasters with other less important markup. Hello there, I found your web site via Google at the same time as searching for a comparable topic, your website came up, it appears to be like great. I have added to favourites|added to bookmarks.